Governor Deval Patrick delivers his State of the State address in the House Chambers at the Statehouse in Boston, Wednesday, Jan. 16, 2013. 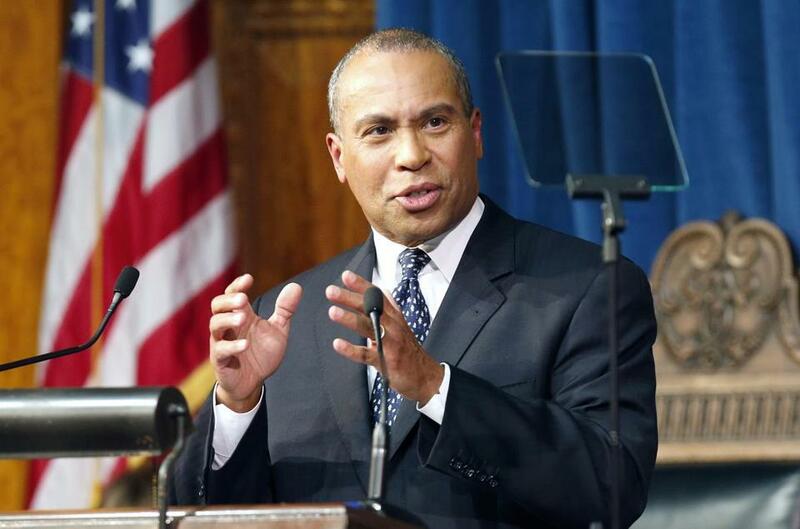 Governor Deval Patrick unveiled more elements of his tax plans Thursday, including proposals to gradually raise the gas tax, MBTA fares, turnpike tolls, and Registry fees, plans he says will stabilize the transportation system long into the future. Patrick’s blueprints would also eliminate 45 personal tax deductions worth $1.3 billion annually, including deductions for T passes, college scholarships, and dependents under 12. The new elements follow Patrick’s announcement Wednesday of what is the core of his tax plan: raising the ­income tax from 5.25 percent to 6.25 percent while cutting the sales tax from 6.25 percent to 4.5 percent. The changes, if approved, would take effect in 2014 and would result in higher taxes for about 50 percent of residents, with the biggest burden on higher-income earners. The new elements help bring into focus the sweeping ambition of Patrick’s final two-year agenda. But the plan carries some risk for the governor. While it could cement his legacy, it could also anger voters and ­reignite the once-powerful anti­tax movement in Massachusetts. All told, Patrick’s changes, which also call for the elimination of some corporate tax benefits, would raise taxes by $1.9 billion annually, money the governor wants to use to shore up and expand transportation systems and broaden education programs. The governor’s proposal to tie the gas tax to inflation would add a half-penny to the state’s $.21-per-gallon levy, starting next year, and would trigger automatic increases in the future, as the cost of goods and services rise. Patrick’s plan also depends on increasing MBTA fares, as well as turnpike, tunnel and bridge tolls, by 5 percent every two years, beginning in July 2014. Registry fees would jump by 10 percent every five years, beginning in July 2015. Administration aides ­argued the periodic increases are needed because, over time, inflation erodes the value of fares, tolls and fees. “We’re just trying to keep their purchasing power constant,” said Glen Shor, the governor’s new ­budget chief. Such regular hikes have been previously recommended by transportation policy specialists. But pushing for them now, along with the other tax changes Patrick is seeking, could strike commuters as a double whammy. Shor countered that even though Patrick’s plan represents an overall tax increase, roughly half of taxpayers would see either a cut or no change in their taxes. That is because Patrick is seeking to double the amount of earnings that are exempt from income taxes, going from the current $4,400 for a single person to $8,800. That means workers who earn $50,000 a year would pay income taxes on $41,200 of their income, exempt­ing a larger share of their paychecks from taxation than workers who earn, say, $150,000 a year. The goal, Shor said, is to push more tax burden onto higher-income earners and reduce it for those earning less. “You increase the fairness of the tax system overall,” said ­Noah Berger, executive director of the Massachusetts Budget and Policy Center, a liberal ­research group. But Jim Stergios — executive director of the Pioneer ­Institute, a conservative think tank — said Patrick’s plans would hit many middle-class taxpayers, who are facing stagnant household income and rising federal payroll taxes. Indi­viduals who make more than $50,000 a year and families who make over $60,000 a year would all see a tax hike ­under Patrick’s plan. “That’s not the 1 percent,” Stergios said. Patrick aides argued, however, that the increases are relatively small for the middle class. For example, a family of four earning $60,000 would pay $91 in additional taxes each year, while a family earning $160,000 would pay $957 more. The overall tax increase of $1.9 billion is the result of several changes to the tax code. Raising the income tax rate and cutting the 45 deductions raises $2.8 billion, while lowering the sales tax costs the state $1.1 billion. And eliminating three corporate tax benefits raises $194 million. The list of 45 deductions that Patrick is targeting for elimination would affect a wide range of residents. They ­include deductions and other existing benefits for removing lead paint in a home and adoption fees, as well as capital gains on home sales. Some said the call for higher taxes could reawaken the state’s antitax movement, which has scored notable policy victories in the past but has been quiet in recent years. One of those victories was passage in 2000 of a ballot question to cut the income tax from 5.95 percent to 5 percent. In 2002, the Legislature effectively froze the rate at 5.3 percent, while adding triggers that would lower rates further only if benchmarks were met. Citizens for Limited Taxation, an antitax group that helped push the ballot question, said it is clear that Patrick is now trying to “tax the rich” disproportionately. Representative Daniel B. Winslow, a Norfolk Republican, said Patrick’s move could energize the GOP. He recalled how Republicans picked up seats in the House after the governor signed a sales tax ­increase in 2009. Winslow said voters do not believe that state government has eliminated enough waste and fraud to warrant the infusion of $1.9 billion in fresh tax money. “A part of the problem is that there is a lack of confidence,” he said. Some business groups are also on edge. The Greater ­Boston Chamber of Commerce, which had initially released a noncommittal statement about Patrick’s plans, expressed deeper reservations Thursday.